A while back, I photographed a story about Haleakala, the volcano located on the island of Maui. This is a very popular tourist destination where people go to watch the sun rise or go for a hike in the gorgeous volcanic crater. It is also a sacred place for the native Hawaiian people. I had the good fortune of not only landing the story on the cover of Smithsonian, I also gathered video and audio for a multimedia piece that was subsequently edited by the team at Smithsonian Magazine and published on their web site. There is now an HD version of the final piece to my web site as well as my Vimeo channel. I’m very proud of this piece as it was extremely difficult to produce. I gathered all of the sound in the field. I shot the video footage at the same time I was shooting stills. It was not an easy task, but I was thrilled to have the opportunity to do so for such an amazing publication. Aloha and mahalo nui loa for visiting my blog! 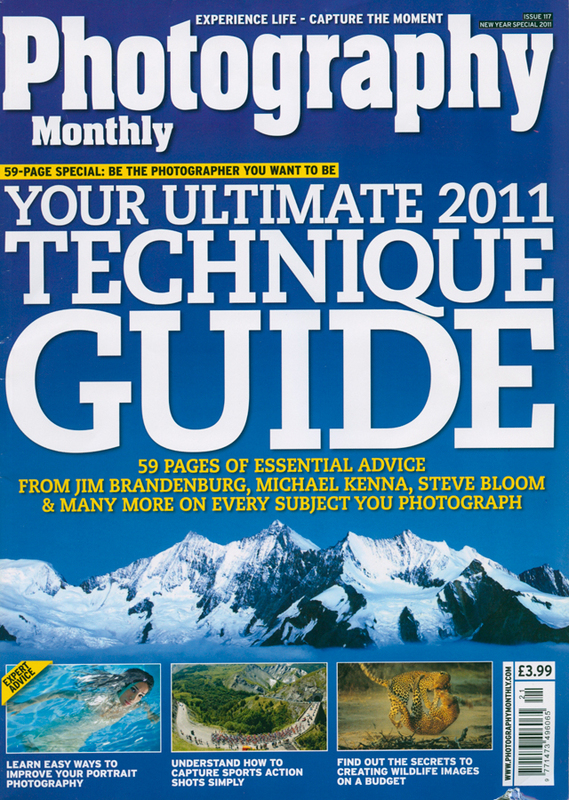 Although this announcement is a bit behind schedule, I am pleased to show that I was featured in Photography Monthly’s 2011 Technique guide. The magazine is based in London and published in the UK. 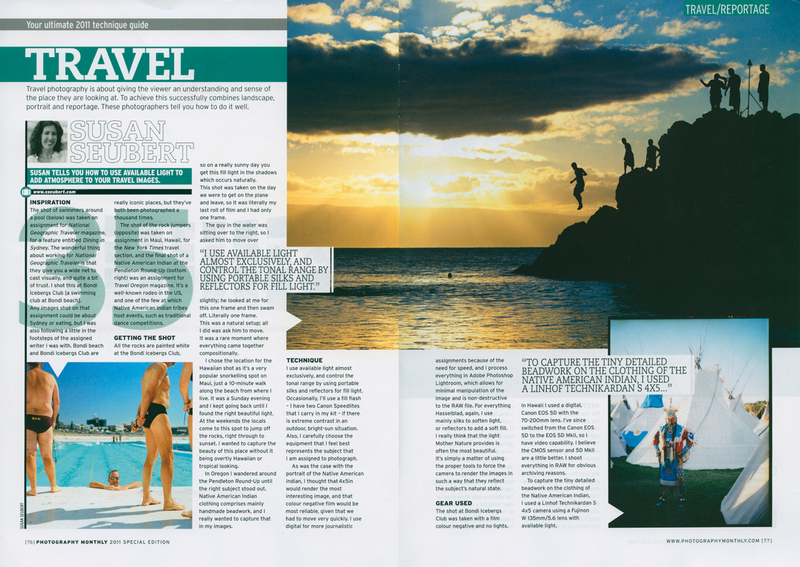 Although the story was not published online, I received a wonderful double page spread featuring my work as well as a lovely interview which discusses the techniques I use as a professional travel photographer. Cheers! I have gotten tons of traffic to my previous blog post about my experience with the Canon 24-105mm lens problem. Basically, if you get an Error 01 message on your camera and you’re shooting with a 24-105, it is the lens, not the camera. I now have two of these lenses that I travel with: one new one and the old one which has been serviced. It seems like there is no rhyme or reason to the failure, it happens spontaneously and without notice, leaving whoever is shooting with that lens stranded. Canon has been very responsive to all of my problems – their CPS program is top notch. But it is indeed irritating to be on location and have equipment failure. On the other hand, I’ve had my fair share of purely mechanical failures before the popularity of shooting digital. My Hasselblad has fallen apart more times than I care to think, but because it’s mechanical and the problem is usually due to normal wear and tear that a professional would bestow upon heavily used equipment. This issue with the Canon 24-105mm lens is vexing, but I haven’t been notified of a recall. If I am, I’ll be sure to post about it and if I get any insight from Canon as to why this problem seems so prevalent, I will share whatever information I can. All I can say is that if you are going to get the lens repaired, send the body in to a Canon Factory Service Center with it and have everything inspected and cleaned at the same time. If you are a serious pro shooter, apply for the CPS program. The technicians know their stuff and do a great job with repairs and cleaning. Happy Shooting! 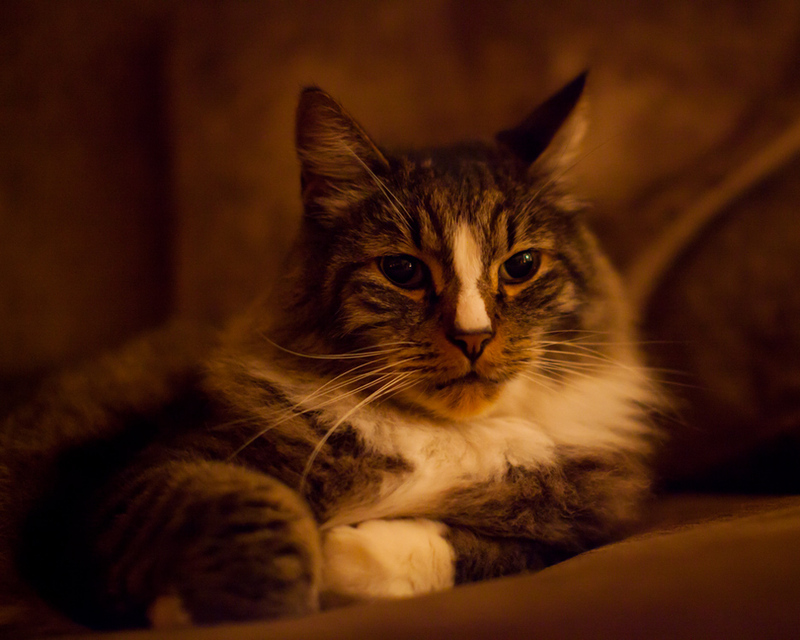 This year, I broke down and purchased a Canon 50mm 1.2 L series USM lens. It is spectacular for portrait work because of its amazing bokeh. There is a lot of chatter out there about the spectacular price difference between the 1.2 and the Canon 1.4. I also own a Canon 50mm 2.5 macro which is instrumental for me for shooting details of things from food to flowers but for portraits, the 1.2 can’t be beat. Here are two examples. 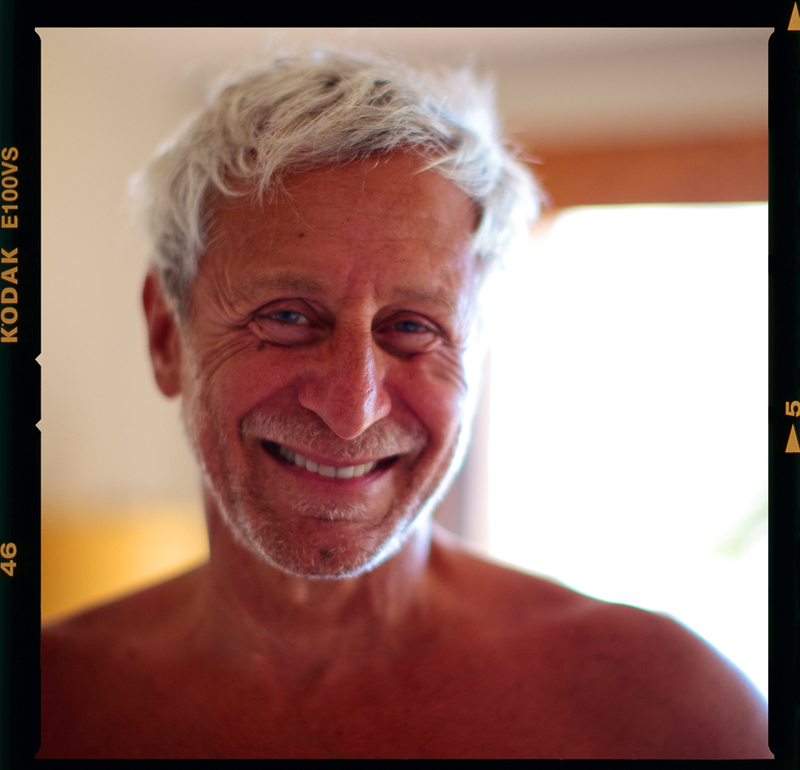 One is a portrait of my husband, which I dropped into a film frame for effect – I’ve long been lugging around an analogue Hasselblad with a beautiful 80mm lens, which I’ve used for years as my primary portrait lens. It’s also fantastic combined with a few extension tubes. However, now that I’m moving into an almost exclusively digital workflow, I had to find a lens that I was happy enough with to leave my Hasselblad behind when going on assignment. Don’t get me wrong, I still love working with film, but the practical side of my business has forced my hand on this one. I’ve been taking the d65 wokrshop every other year to keep current on the latest digital workflow which has led me to adopt working almost exclusively in Adobe’s Lightroom. That software combined with the Canon 5D Mark II’s and lenses I work with give me a great way to process thousands of images in a relatively short period of time, without sacrificing any amount of quality. (This year’s processed tally is almost to 13,000 client delivered images). My digital library is now more organized than ever – I can find any image with just a few clicks of the mouse. I hope you find this information useful! Greetings! 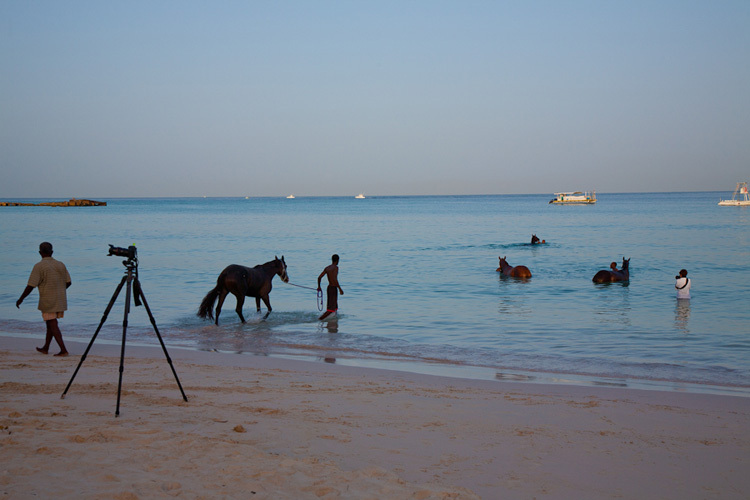 As National Geographic Traveler is publishing the story I photographed about Barbados in the January/February 2011 issue of the magazine, I thought this would be a good time to write about the importance of having an extra set of hands around on a shoot. These days, editorial budgets are very tight, so sometimes the job won’t allow for one but in certain instances, having a partner on a shoot is indispensable. The other caveat is that often times I’m asked to also shoot video and collect audio, making my work at least three times as complicated as it was pre-multimedia. That said, I always like to rise to a challenge, so I tried being a one man band for the first day of this assignment and realized, quickly, that it would be impossible for me to do a good job in Barbados flying solo. Enter: fixer. I am blessed with a partner in life that not only has an MFA in photography, but also can get himself halfway around the globe in 24 hours or less. He was with me the morning of the shoot with the horses and took a couple of stills of me in the water. I was just perusing some of the images and realized that he illustrated precisely why – under certain circumstances – it is necessary to have someone watching your back. Barbados is as safe of a place as one can get in the Caribbean, but add thousands of dollars worth of camera equipment left unattended on a beach and voila, it’s like finding cash sitting around on the ground. Anyone would be tempted to walk off with my carbon fiber Gitzo fitted with a heavy-duty Manfrotto head and, set atop it like a crown jewel, a Canon 5D Mark II with a pristine 24-105mm lens with lens hood, a 77mm polarizing filter and a nice Crumpler strap. Not to mention my favorite accessory – a three-way hot shoe level. It was enough of a bummer to not have a water housing to work with, but that didn’t stop me from walking into the water up to just above waist deep, to get as close as I could to the horses. Lost in my enthusiasm, I simply left the other camera with aforementioned accessories, sitting behind me on the beach. As I look at the photo of me in the water, I can tell that I was drawn in by the dawn swiftly changing to daylight, as is evidenced by the light on my white shirt. 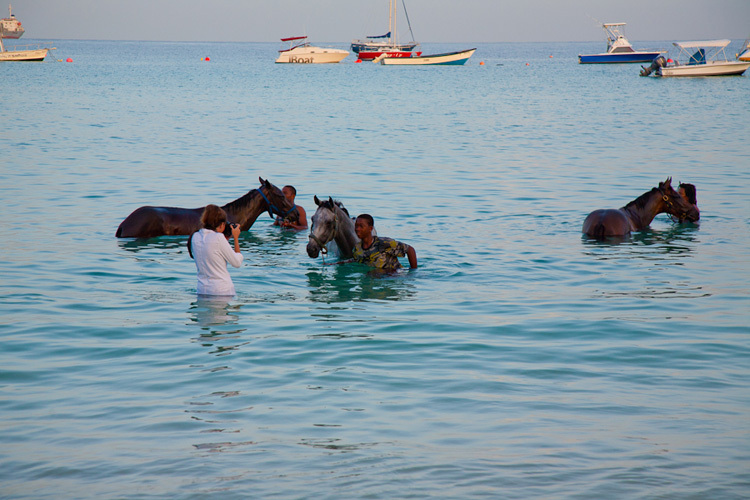 These men and their horses were just then becoming well lit and I only had a few minutes before the magic of that morning dawn would turn into the white-hot Caribbean day. In hindsight it was a bad decision and without my fixer there, would have most likely been a great loss. But he stood on the beach, watching the gear so I could get the shot. For that moment, I will be forever grateful to him. A couple of weeks ago I had an opportunity to sit down with photo editor extraordinaire, Mike Davis. If you haven’t visited his web site, you should. It’s chock full of useful information and good stories. Here in the backwaters of Portland, it’s rare to be able to have someone with such a remarkable résumé look at your work and give an opinion. So I found myself at his doorstep, slightly hesitant, knowing where he’s been and who he has worked with and thinking that perhaps what I shoot isn’t up to his par. My work has largely consisted of travel photography, mostly features for publications like National Geographic Traveler and The New York Times. In the past, he has hired me to shoot for Mix magazine, when he was the editor there, but there’s something vastly different about bringing a group of photos to your assigning editor versus showing up with a hard drive containing over 600 random pictures just to see how he/she would sequence them. 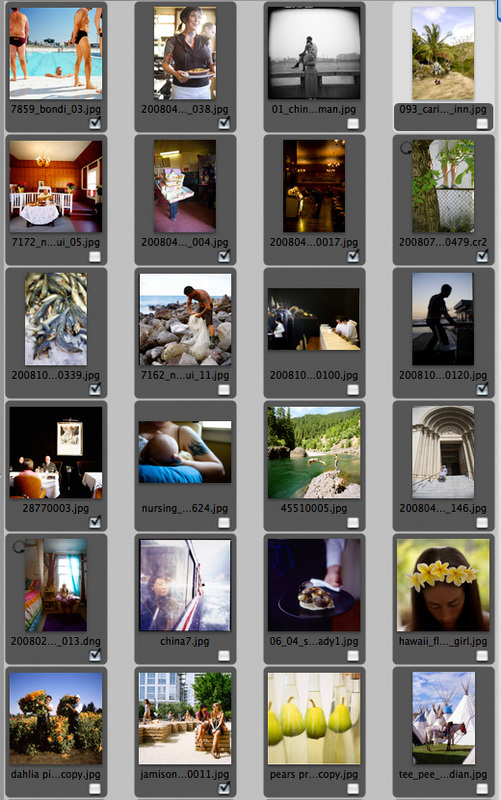 I don’t know if it was good or bad that it took only a couple of hours to whittle those images down to a group of 24. I had given my husband the same group of images with the same missive: edit the 600 down to 24. He is no schlock when it comes to editing photographs. He definitely has a completely different history: one informed by the complex world of fine art photography which is often out of step with Mike’s world: one that is heavily steeped in the tradition of photojournalism. My husband is also just that, my husband. He can’t possibly see my images without seeing me, (and my fragile ego). Although what’s amazing is that there was a certain amount of crossover. It’s important to find someone whose vision you admire and then allow them to see your work wholly through their eyes. Step aside and let them look, check your attachment to pictures at the door. Mike’s history and experience informs all his decisions about how he sees. His perception is truly unique. He saw things in my pictures that I never have and never could. It was a wonderful experience and I’m sad I didn’t take more pictures for the initial edit. I’m thinking of going back. These images were made with every possible variety of camera from Holga to Hasselblad. I’ll be printing this as a small book soon.